They are almost all Mitt Romney. 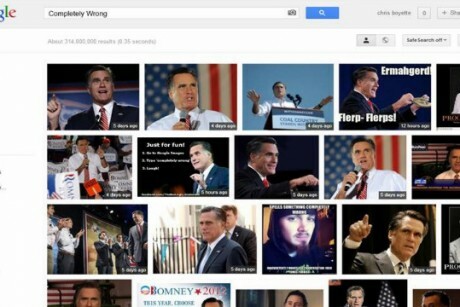 Pages and pages of image results, of Mitt Romney being "completely wrong." Apparently, the images show up because they're linked to Romney's apology for the comments he made in the now infamous 47 percent tape -- which he later called "completely wrong." CNN, who spoke with someone at Google, writes that this is "the unintentional result of normal Google analytics" (which I like to believe is code for: "the Internet hates Mitt Romney") "which produce images associated with popular phrases in news headlines and search terms, and not the result of any effort to skew the results." Pretty soon, search results for "completely wrong" are just going to show photos of photos (of photos?) of Mitt Romney. In other words, Mitt Romney is now caught in a recursive loop in the Internet. Way to go, Internet.